Located on British Columbia's rugged northwest coast, Nisga'a Lands are blessed with soaring mountains, dramatic lava beds, picturesque fjords, and thriving rivers and streams. The natural beauty of Nisga'a Lands is complemented by the Nisga'a Nation's rich cultural traditions. Flying time from Vancouver International Airport to Terrace is 2 hours. 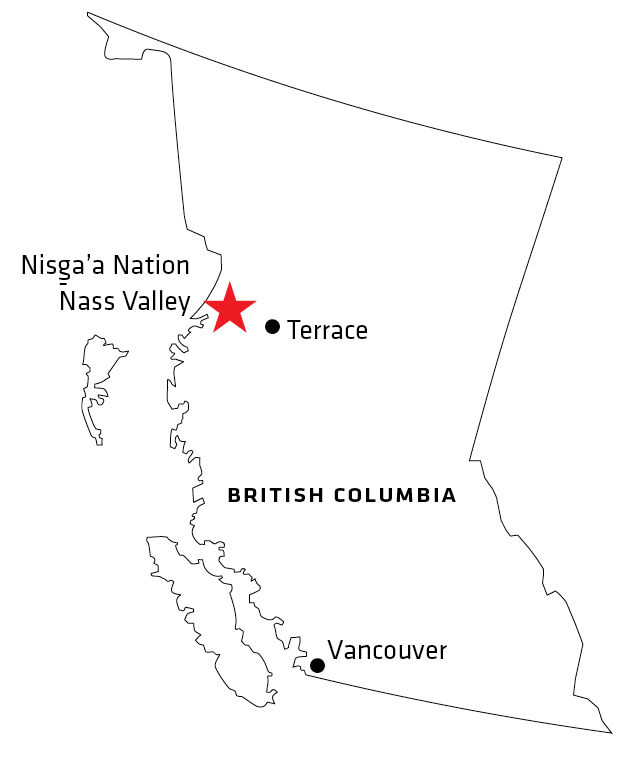 From Terrace, the drive into the Nass Valley is approximately 100 km northwest on Nisga'a Highway 113 to the Nisga'a Village of Gitlaxt'aamiks (formerly New Aiyansh). Driving time from Gitlaxt'aamiks to the Nisga'a Village of Gitwinksihlkw is about 15 minutes. From Gitwinksihlkw to the Nisga'a Village of Laxgalts’ap is approximately 40 minutes. From Laxgalts’ap to the Nisga'a Village of Gingolx is approximately 30 minutes. These maps are not to scale and are for general information purposes only.